First project, which had mention in Foxy's last report but lacked a detailed report, a modernization of the Alacrity class destroyers. First proposal is a moderate level 3 overhaul (15%/240t) to include upgrading the weapons and electronics suites, second is more comprehensive including a new power plant (25%/400t) The subsequent Dauntless and Firefly classes would get similar if not identical refits, since despite build dates of 1933 and 1935, I can find no separate sim report for them, and assume they were built to the 1928 plans. Addition of Radar, Sonar, DC throwers, etc. The 57mm guns are simmed as breach-loading guns; presumably a mistake. Of the two choices, I'd probably prefer the cheaper level three overhaul. These destroyers are decent for late 20s / early 30s destroyers, but they're fairly small and probably not worth too extensive a refit. Just my opinion. Yeah, that's a common goof I make. Adjusted both sims to 57mm Automatics, the cheap one loses 5t misc weight, no other effects for the latter design. New construction is the ultimate solution, but even a crash program will take time to create the amount of destroyers I feel Oz needs, so no matter what, they're expected to be on the rolls for another 10-15 years. The Alacrity class have machinery and hulls 18 years old (as of 1946), so they only realistically have around 8 years effective life left. So its probably not worth doing more than the 25% refit on these to update them enough to keep them relevant. The Dauntless class have machinery and hulls 13 years old (as of 1946), they could realistically last another 10-15 years service, they could probably last with their original powerplant but the new powerplant gives much better range which is vital for RAN operations, so its cost effective and worth doing the full 50% refit on these ships. Firefly class have machinery and hulls 12 years old (as of 1946), they could realistically last another 10-15 years service, like the Dauntlesses, they too could make do with the original machinery. I think a 50% refit should be option for these ships depending on whether tonnage and dock space is available, or whether the pressures refits of other ships makes the cheaper and quicker 25% refit more appealing. Eh, that could be viable, too. If you were able to sim up an Alacrity subclass with a 1933 sim date, I'd be fine if you substituted that sim for the Dauntless and Firefly subclasses. 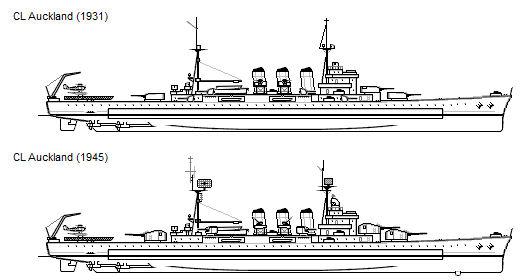 As long as the major specs (size, armament, light tonnage, etc) didn't change, I think it would be perfectly fine to use that instead of the 1928 base design. I believe we've allowed that in the past, but can't recall where or when. With an annual output of 40000tons, the difference between 240t and 400t per refit (Or 1200 vs 2000 for each class) isn't a drastic concern, and I'd lean towards the more capable refits by a strictly game mechanics evaluation. Likewise, by game mechanics, either refit gives the life extention refurbishment that should last another 15 years. I ginned up a report for a 1933 update for the Dauntless and Firefly classes, based on the above - Same light tonnage cost, main adjustment is additional bunkerage and some Misc weight. with a 15% refit, revising the main armament from 5x1 to 3x2 automatics. A 25% refit would pretty much result in the same as above. Revised graphic for the RAN 1500t type, more in line with the commonwealth design style of the late 20s, early 30s. The break should be about 111ft by wl length, the forecastle being 30% in the report. Actually I think that is a poor sim artefact, Foxy should have had a typical 15-20% forecastle and then added the 10% as the midbreak, otherwise from the report it looks like the fore gun would be some 100ft from the bows! Yeah, I think it's a goof on Foxy's part, but it's a long-standing and consistent one at this point. Despite all his graphics showing the more traditional midships hull break, all his destroyers are simmed the same way, and as I interpret it, that dictates the break is forward of the main gun. His graphics also had late 30s-40s RN DD superstructures on everything, which i revised to more closely match historical late 20s designs. This seemed the most elegant solution, and it'll give the RAN destroyers some visual character, if nothing else. I get the character issue and I agree it makes them look unique. However I noticed you have used some of my own "parts" for the drawing with perhaps not as much understanding of what's actually drawn. The most obvious to me is the splinter shield deck aft of B turret, on Atlantean destroyers of the area it protrudes out over the next deck below and is flush to the hull hence the "X" bracing support. Later Atlantean destroyers (though I have no current drawings posted to show it) have this area plated over so its a more sheltered area. Given what the hull would look like aft of the break you either need another protruding deck below the first with another X bracing support or one very tall support. That said everything else looks quite spiffy to me. I actually did consider that, and was thinking that the upper deckhouse in question was narrower than the deck section protruding aft from the hull break, which would be closer to the full width of the hull. I've got a couple of huge files with parts and inspiration drawn from a lot of people who've drawn in the same/similar style and scale, and I don't always remember where I pulled them from originally at this point. I try and do enough work to make things as much original work as anything else, but i'll admit i'm powering through a lot of stuff since i'm at a point where i'm ready to move forward with Oz's reports, it's just a matter of figuring out exactly what's being built, and a large part of that process (for me) is having an idea on how the designs work visually, especially when it comes to refits. I'm mostly trying to get the basic layouts down so i can get the industrial reports moving forward, and worrying about properly Oz-ifying them when I'm less behind on all that. A lot of the things I'm used to doing to "Canadian-ify" a design don't really apply to Oz, and it's throwing me off a bit. Still debating the best approach for the DD modernizations, but I'm leaning towards the more expensive option for the additional range they get, among other benefits. Wouldn't replacing two single 4.7" with two twin 4.7" automatics forward on the Dauntless class cause weight issues? How about dropping the B guns and replacing them with more ASW and AA equipment? Is there a reason for reintroducing the 7.5" guns back into the RAN on the Aucklands? How about 6" twin automatics? Saves you some weight especially with the heavier secondaries and maybe allows for more AA guns and equipment.